A journalist examines the life of an important but neglected British-born cookbook author. Federman tells the story of Patience Gray (1917-2005), who became a world expert on the cuisine of the Salento region of southern Italy. Gray was born into an upper-middle-class family that she later remembered for its Edwardian rigidity and hypocrisy. While a student at the London School of Economics, she began frequenting leftist and artistic circles. She had two children out of wedlock, lived in a small cottage with no electricity or running water, and scratched out a living as a freelance designer and editor. 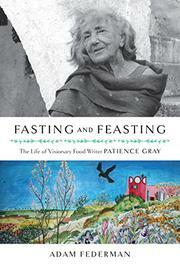 It was during this period that Gray developed an interest in foraging, which she did to supplement a restricted wartime diet. Her first cookbook, Plats du Jour, appeared in 1957. With its emphasis on simple cooking that took its cue from Continental—especially French, Italian, Spanish, and Hungarian—cuisine, it became a “standard reference” for “the average home cook.” At the same time, Gray began questioning the new British love affair with consumerism. Along with her partner, Belgian sculpture Norman Mommens, she traveled across Europe in search of a place where she could lead a simpler, more authentic life. The journey took them first to the Greek island of Naxos and then to the extreme south of Italy, where they settled in an old farmhouse called Spigolizzi. Embracing a radically simple lifestyle, they lived off the land, ate according to the seasons, and created art. Federman’s book is meticulously researched, but the amount of detail may prove dry for general readers. Still, the author’s portrait of the complex, fiercely independent woman who reshaped ideas about cooking and food and about what constitutes a life well-lived in a world defined by the “numbing effects” of modernity is intriguing and well-rendered. A highly detailed traditional biography of an unconventional woman.